Every single person in Trump’s cabinet denies the existence of climate change at a time when scientists are ringing the alarms louder and louder. The latest research shows the world literally has 3 years to make aggressive progress on bringing emissions down – if we don’t, we will cross irreversible tipping points and feedback loops. The good news is that, for the third consecutive year, the world’s carbon emissions are flat … even as the economy grew by 3%, according to the Global Carbon Project. This is a sharp contrast from a decade ago, when emissions grew about 3% a year, notes Glen Peters, a scientist at Norway’s Center for International Climate and Environmental Research. Leveling off of emissions is directly attributable to less coal burning in the US and China. But stabilizing emissions isn’t good enough – we’re still sending 41 gigatons of carbon into the atmosphere every year. Emissions MUST come down and fast. Under the Paris Accord, nations agreed to stay below 2°C and to shoot for 1.5°C, which would be far safer. As of 2016, we are at 1.2°C, according to NOAA and the World Meteorological Organization (WMO). In 2016 – the hottest year yet – atmospheric carbon levels crossed the threshold over 400ppm of carbon – permanently. We are now at 410ppm year-round. Arctic ice is at all-time lows. Most researchers expect an ice-free Arctic between 2030-2050 – the first time in more than 100,000 years. “Changes to the Arctic are so significant they will have implications across the globe, including worsening monsoons in Asia, extreme temperature records and the inundation of coastal cities,” reports Scientific American. The Arctic is a profoundly different place than just 10-15 years ago, they say. Over the past 40 years, sea ice has dropped by 65% and what’s left is often thin, green ice. 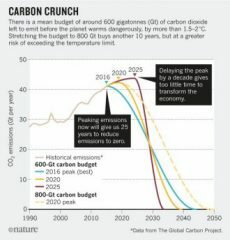 If emissions don’t peak by 2020 and then rapidly bring them way down, we’ll reach 2.5ºC by 2050, costing the global economy a staggering $12 trillion by then to deal with the ramifications, according to Pursuing the 1.5ºC Limit, by the United Nations Development Program. The latest from the International Energy Agency (IEA) is that the world must reach ZERO fossil fuel emissions by 2040 to limit warming to 1.5ºC. Under a business-as-usual scenario, temperatures will be over 7°C higher by 2100 – not a pretty picture. Everything is changing, everywhere. Climate change impacts are documented across every ecosystem on Earth, researchers say, and they are beginning to collapse. At 1.2°C higher than pre-industrial times, there is virtually no place on the planet that isn’t affected by climate change, says a major research study published in Science. Imagine what the results will be when we reach 2°C and beyond. The fact is, we can’t imagine it, which is probably why climate deniers can still exist. At 1.6C, Greenland’s ice sheet faces irreversible melting – raising sea levels by at least 7 meters. Antarctic melt is speeding up. Spring arrives earlier and earlier in the US east and later in the west, disrupting the timing for many songbirds. Timing is everything: arrive too early and get caught in a winter freeze; arrive too late and the spring insects they rely on to raise their young are gone. The world is in the midst of the greatest extinction since the dinosaurs. By 2020, animal populations will be down 67% from 1970, says World Wildlife Fund. That’s from climate change, habitat loss, pollution, over-fishing and hunting. In his 32nd book, “Half Earth: Our Planet’s Fight for Life,” published last year, biologist E.O. Wilson says, “To save biodiversity, we need to set aside half the earth’s surface – land and sea – for wildlife.” This would save 80-90% of species, he says. “Large parts of nature are still intact – the Amazon region, the Congo Basin, New Guinea. There are also patches of the industrialized world where nature can be restored and strung together to create corridors for wildlife. In the oceans, we need to stop fishing in the open sea and let life recover. The open sea is fished down to 2% of what it once was. If we halted those fisheries, marine life would increase rapidly,” Wilson explains. Renewables must supply at least 30% of electricity, up from 23.7% in 2015. No new coal plants can be built after 2020 and existing coal plants must be on a path to being being retired. $300 billion a year must be spent to decarbonize buildings and infrastructure by 2050. At least 3% of buildings must reach zero- or near-zero emissions structures each year, starting now. Electric vehicles must comprise at least 15% of new car sales, up from 1% now. Fuel economy for heavy vehicles should increase 20% and aviation needs to cut emissions 20% per kilometer traveled. They also suggest doubling mass-transit use. Policies must be enacted that encourage forest restoration and dramatically reduce deforestation – to near zero by 2030. Agricultural practices must be changed so that carbon is stored in the soil, rather than being released into the atmosphere as it is now. Polluting industries need to cut emissions by half by 2050. At least $1 trillion a year must be mobilized for climate mitigation and adaptation, whether from green bonds or private investments. Strong focus on communicating climate science and the solutions in a way that society can accept and absorb the reality. “We are actually responding to the climate change challenge. Our energy system changing at dramatic rate, and these changes and also economically viable. But we also need to look at other sectors including food, transportation, finance, buildings and industry. Change isn’t happening at rate it needs to to meet Paris targets, but it is still possible to do so, so now is our moment to act,” says Katherine Richardson, biological oceanography professor at University of Copenhagen. Read the report, 2020: The Climate Turning Point. British economist Nicholas Stern puts it this way: if we continue on our polluting, high-carbon path, this will lead to self-destruction. At this point, the cost of inaction is much higher than the cost of action. While cutting emissions radically costs about 1% of world GDP, leaving them unchecked could cost 5-20% of GDP each year.